Eclectik Furniture is a Melbourne based wholesaler of high quality indoor and outdoor furniture, homewares and artwork. We have a diverse range of contemporary products, for the buyer with discerning taste. The articles below touch on a few of the quality materials utilised in the design and manufacture of our outdoor furniture collection. This is by no means an exhaustive coverage, but an example of our commitment to quality and craftsmanship. This commitment to quality and craftsmanship is also applied to every item within our wide range of stylish interior furniture and our extensive homewares, and artwork collections. We Guarantee it! 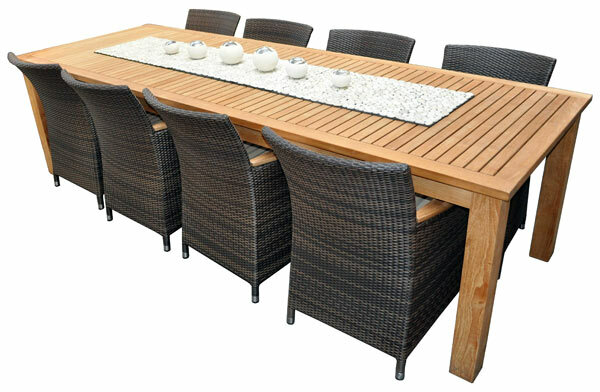 Teak is considered to be the best wood to use for outdoor furniture because it is an immensely stable timber that has high oil content, a natural water repellent that is virtually immune to rotting and termites. A tropical climate timber, naturally resistant to the elements, teak is a tall, sturdy, evergreen tree indigenous to South eastern Asia. Indonesian Teakwood, the favourite among shipbuilders in centuries past for its durability, is a light-grained hardwood which is impervious to the constant salty wind and water, withering sunlight, and lashing rains of the untamed seas. A grade teak comes from the centre of the teak tree. It is far more stable and durable that other grades of teak. A grade teak is far more beautiful to look at and will last a lot longer. A grade teak outside and untreated has a life expectancy of 75 years. Ordinary rattan is a naturally occurring material sourced from Palm trees. It makes for beautiful products but has a major downside - to keep it looking good it needs regular maintenance. Choose wooden or iron furniture an you can expect years of maintenance care, cleaning, sanding, painting and varnishing. That's time you could spend relaxing. Eclectik Furniture is different. Our durable garden furniture is made using RAUCORD, a premium grade material by REHAU®, that requires no maintenance and can live outside all year! Created using German technology, REHAU RAUCORD® is inspired by natural rattan and is recyclable, so it's not only kind to your pocket, but to the planet as well! It is fade-resistant so leave it in the brightest sun and it will keep it's colour. Leave it beside the saltiest of sea and it won't corrode. It is solid-colour throughout so scratches vanish. And because it is made from polymer materials it will not rot, whatever the weather. It is flexible so can be comfortably woven into any style but has the strength to prevent sagging, cracking or breaking. Spillages don't mean stains. Mould and odours are a thing of the past. Unlike natural rattan or cheaper all-weather rattan furniture it won't fade, rot, stain or show scratches, and the cushions are available in an exciting range of colours to perfectly match the colour of your wicker! Quite simply it's the best all weather rattan available. When you want rattan garden furniture, why wouldn't you want REHAU RAUCORD® by Eclectik Furniture? WHEN YOU WANT RATTAN, WHY WOULDN'T YOU WANT REHAU®?